I’ve written before about my love for sweet potato. 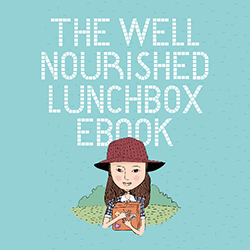 I first came across its use in sweet dishes in Well Nourished’s Berry Nice Brownies, and I also developed a recipe for Sweet Potato Pancakes with Cinnamon Cream Cheese and Candied Pecans. But these Sweet or Savoury Spiced Sweet Potato Waffles are my new favourite. I’ve been testing them out for weeks, much to the delight of my boys (husband included! ), including trying out gluten-free and dairy-free variations, which are included at the end of the recipe. They are versatile and complement sweet and savoury toppings. Eat them for breakfast, lunch, or dinner! 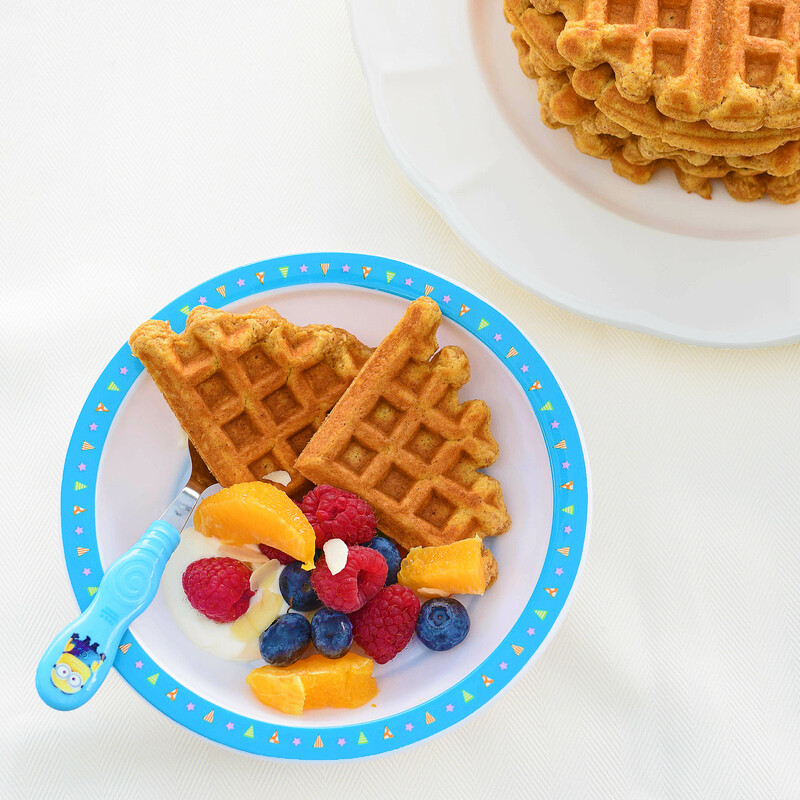 The waffles are completely sweetener-free, as I prefer to add sweetness to the toppings. When cooking the waffles, please follow the manufacturer’s instructions for your specific waffle maker. The number of waffles this recipe makes will vary depending on the size of waffle your waffle maker produces. I use an ancient waffle maker that my Mum used when I was a kid, which painstakingly produces one 7 1/2 inch waffle at a time. It has no ‘on’ switch and the light is broken, so I just wing it. I prefer a longer cook for a crispier waffle. Now I’m really starting to waffle on (hee hee). For convenience, I have included below two separate ingredient lists, to suit those cooking for themselves or for a group. 1. In a large mixing bowl, combine the dry ingredients: wholemeal plain flour, baking powder, cinnamon, ginger, and vanilla powder. Set aside. 2. In a separate bowl, combine the milk, sweet potato puree, and melted butter or coconut oil. Add the egg yolks and whisk until mixture is smooth. Set aside. 3. In a third bowl, beat the egg whites until stiff peaks form. The bowl and beaters must be completely dry and clean, and the egg whites must be free of any egg yolk, or they won’t form peaks. 4. Add the sweet potato mixture to the dry ingredients, and stir well to combine. The mixture will be quite dense. 5. Add one third of the egg whites to the waffle mixture. Using a spatula, gently fold the egg whites through. This will help to prepare the waffle mixture to ‘receive’ the remaining egg whites: we want to keep it as light and fluffy as possible! Once the first third has been incorporated, add the second third of the egg whites (half of the remaining egg whites). Gently fold through. Finally, add the remaining egg whites, and gently fold it through the mixture. Gentleness is key. 6. 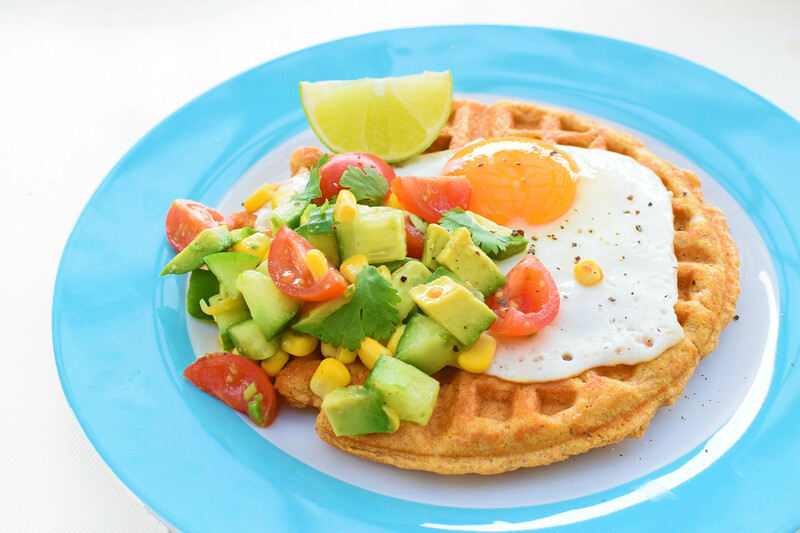 Heat the waffle iron and grease with the extra melted butter or coconut oil. Follow the waffle iron manufacturer’s instructions to make the waffles – the cooking time and amount of mixture used will vary between waffle irons. I use 1/3 to 1/2 cup mixture on my 7 1/2 inch waffle iron. 7. Serve the waffles warm, with your choice of toppings (see below). Fruit: I used strawberries, raspberries, blueberries and orange segments. Banana, kiwifruit and summer stone-fruit would also be nice. A drizzle of rice malt syrup (or honey or maple syrup, but then not low fructose). Next time I will try Miss Marzipan’s Orange Syrup! Chopped nuts: I used flaked almonds. Macadamias, hazelnuts, pecans and walnuts would also be delicious. Peanut butter or other nut butters. Try a chocolate hazelnut spread like I Quit Sugar’s Nut-Ella. Fresh salsa: I used diced cucumber, quartered cherry tomatoes, corn kernels, diced avocado, finely chopped coriander stems and fresh lime juice. Season with salt and pepper. A side of grilled bacon or pancetta wouldn’t go astray! Treat it like a toastie: Cheese; ham and cheese; cheese and avocado; avocado and Vegemite…! Dairy-free: Use coconut oil instead of butter, and coconut milk or almond milk instead of dairy milk. Gluten-free: Use gluten-free plain flour instead of wholemeal plain flour. The waffles may be a little more dense. Oooh nice idea! I’ve added potoato to cakes before but not sweet potato to much! I’ve just found you thanks to IQS Instagram. Sure loving the food creations that I’ve seen on your website so far. 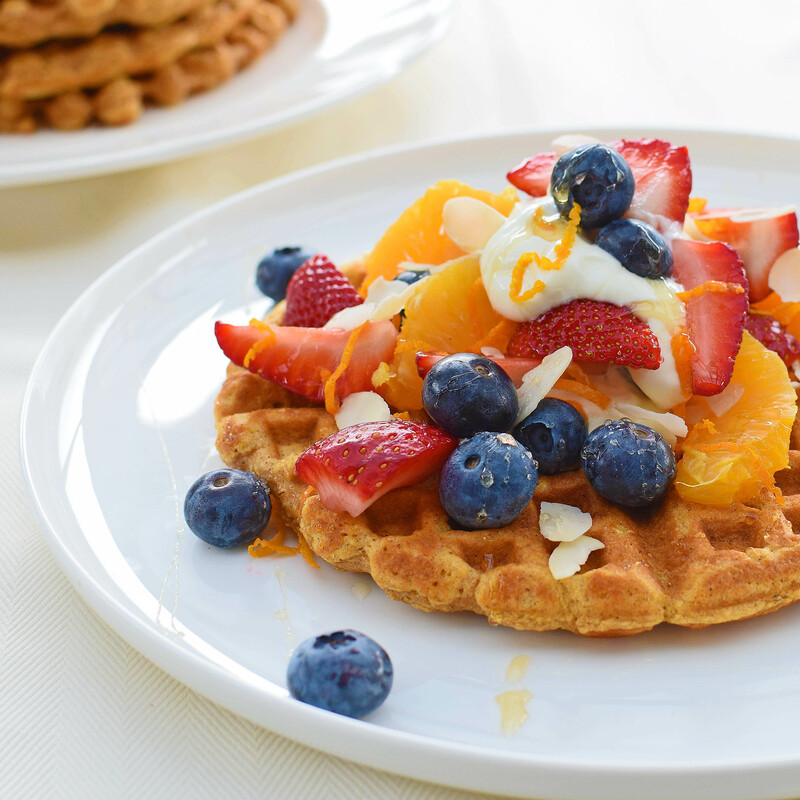 Have to try these waffles (and many more of your recipes) I am also a huge lover of sweet potato. Thanks for your inspiration.